My favourite thing about summer is the fresh summer produce that you can pick up at the farmer’s market. It makes it the perfect season for fresh salads and vegetable dishes. With so many veggies to choose from, I left with a basket of homegrown bell peppers. And let me tell you something, nothing beats a homegrown bell pepper at the peak of the season (which starts now)! So today, let’s indulge in some easy vegan stuffed bell peppers. YES. 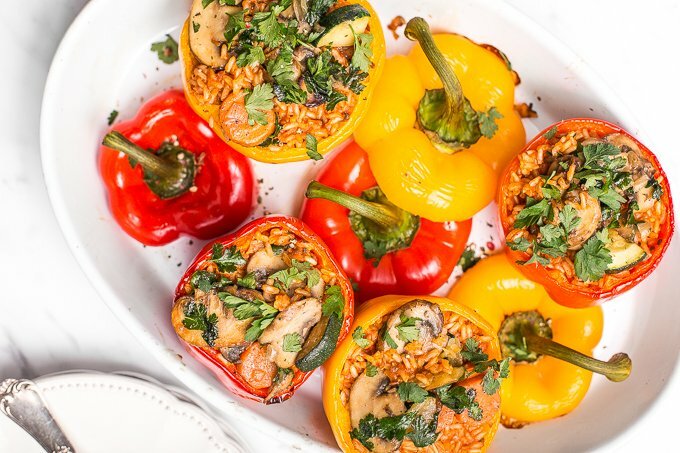 These bell peppers are stuffed with rice and veggies, which makes them super delicious and incredibly healthy. 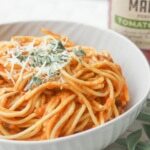 So, if you’re looking for a go-to, easy and delicious week-night dinner option, this just might be the perfect recipe for you. 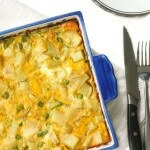 Plus, the leftovers reheat well, so you can pack them for lunch the next day! Win-win! This recipe was something that came as a result of some trial-and-error – and a really good one, I must say! I knew I wanted to keep these vegan or vegetarian and skip any meat or cheese, but wasn’t sure on the seasoning I was going to use. Well, now I am sure, I am very sure! I love how it turned out!! The flavour is really intense! 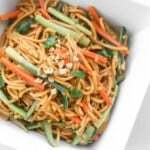 The peppers are tender on the outside and the filling is just pure yummy… the onions mellow as they sauté and provide a backbone for the veggies, the mushrooms add their earthy flavour, and the carrots provide some sweetness. Everything is well-balanced. I personally think that keeping things simple is the magic of this recipe. 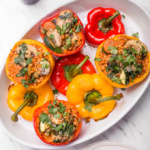 I love serving these stuffed peppers with some fresh cilantro or parsley on top and sometimes with a light salad on a side. Plus, if you are a meat lover, you can “unveganize” this recipe and add some chicken, turkey, or chorizo. Have fun and enjoy! 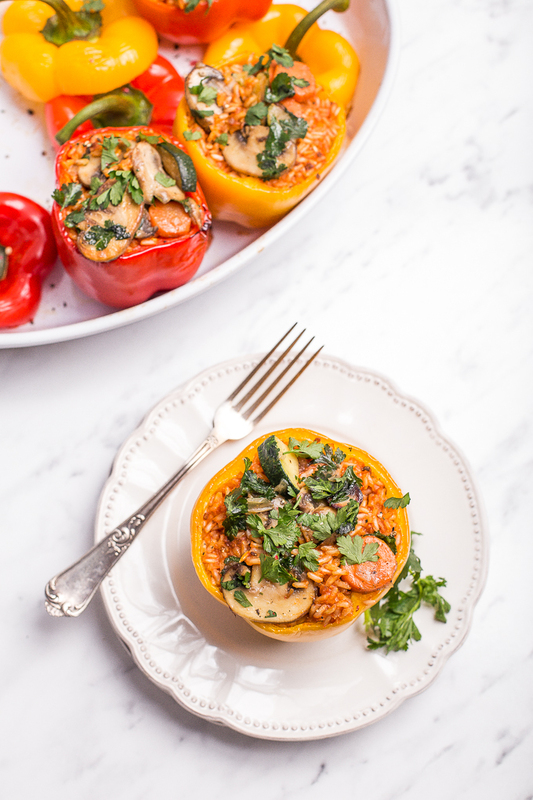 Fresh, homegrown bell peppers baked with an assortment of veggies and brown rice is what these easy vegan stuffed bell peppers are all about!! 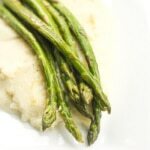 Ready in under an hour, serve this at your next fancy dinner party or make it for an easy weeknight dinner! In a small pan bring a salted water to a boil over medium heat and cook the rice according to the package instructions. Drain on a colander and set aside. 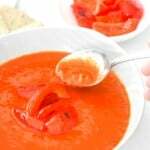 Cut off the tops of the bell peppers (“lids”) and set aside. Scoop out the inside and discard the seeds. Wash the peppers carefully and set aside. In a large pan heat olive oil, add onion and fry for 2-3 minutes until soft. Add the mushrooms and fry for a further 5-8 minutes. Add carrots and zucchini, fry, stirring occasionally for 5 minutes. Remove from the heat. Add cooked rice, 1/3 cup parsley, tomato purée, and stir until well combined. Season to taste with salt, pepper and a pinch of chilli. Divide the mixture between the peppers and place the “lids” on top. Place the stuffed peppers in a greased baking tray. Bake for 20-25 minutes, until slightly brown on the edges. Sprinkle remaining parsley on top and serve. Yum, what a great vegan dinner. 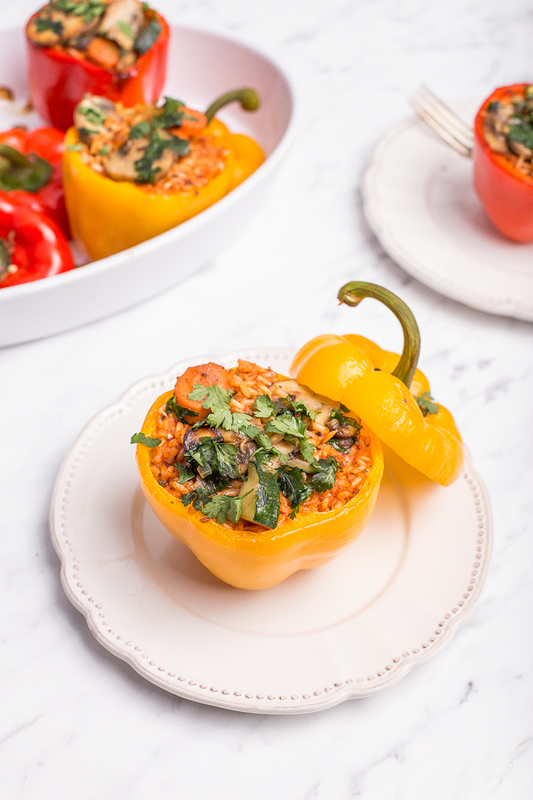 I love these stuffed peppers and They are also easy to swap the veggies I have in the fridge. A perfect meatless meal! 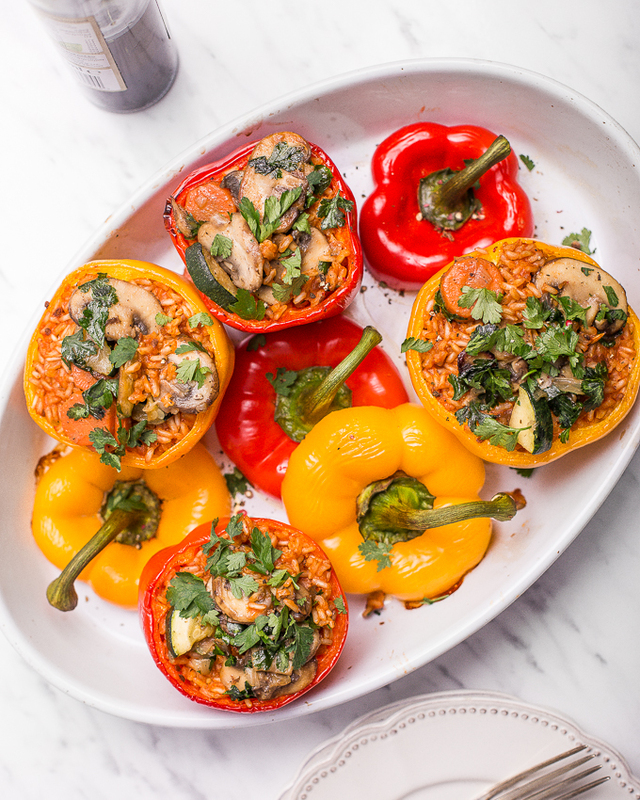 I’m a huge fan stuffed peppers because you can use just about any vegetable in the filling. I’m loving that this recipe has no meat b/c I eat mostly vegetarian, and the veg choices here are great! They looks hearty and filling, too. Definitely need to give this a try! What a gorgeous dinner idea! I am trying to get the boyfriend on board with Meatless Monday (like ten years later…), so this would be a killer recipe to use for that! 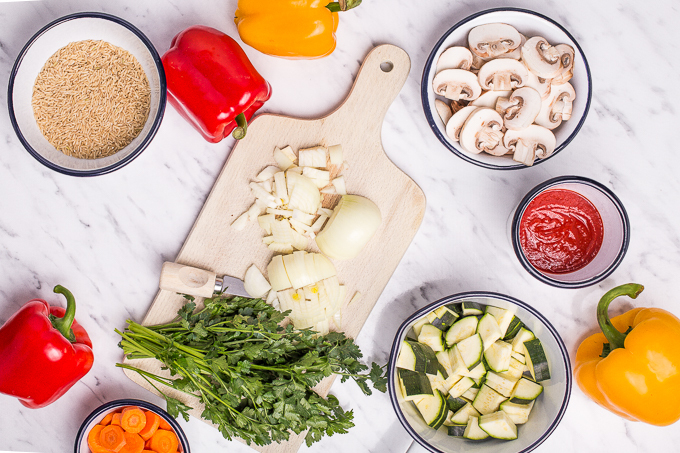 He LOVES stuffed peppers — I can’t wait to try this out! And I love that you used carrots to add a subtle sweetness for balance. Gorgeous! I love stuffed peppers but my husband doesn’t. These look right up my alley and your photos are awesome. We are huge fans of stuffed peppers, especially because you can make them ahead of time. I like to prep everything the night before and leave them in the fridge in their uncooked, but stuffed, state and pop them in the oven when I get home from work. Quick and easy! What a fantastic way to use those fresh peppers in their prime! This dish is so gorgeously colorful – perfect for a family-style weeknight meal.